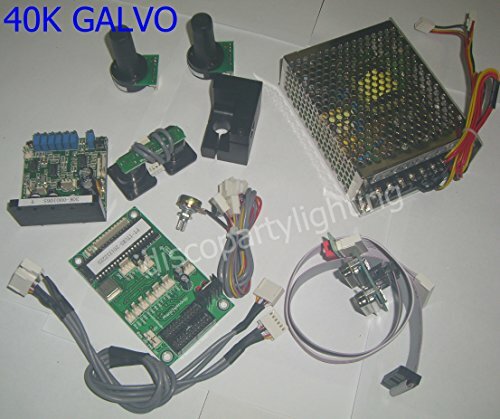 30Kpps laser galvo sets scanner ILDA Closed Loop max 45kpps FEATURES: Standard package includes(same as the picture showing) : 2×Scanners 1x main board (show card) 2×Driver board 2×Mirrors 1×Scanner mount 1×power supply (PUS) 2×Cables driver to scanner 2×Cables driver to PUS 1×User manual Deflection angle Speed@ Mirrors size 20º optical deflection >25.000pps 15º optical deflection >30.000pps 8º optical deflection >40.000pps 5º optical deflection >45.000pps Power source Power source is not very critical and has minor influence on speed and quality of the complete scanner system .Even if a standard transformer with a bridge and caps will do, We recommends a stabilized or switched power supply. The driver board is able to run between +/- 24VDC to +/-28VDC, at 1A each. Recommended power supply is the PSU with 2x24VDC. If you use transformer and bridge, then make sure to have minimum 10,000 uF caps per voltage, better 40,000 uF, parallel with a 100uF for fast peaks. Do not use extra capacitors at switching power supplies. SERVICE & SETUP: This is a commercial product which may require ongoing and initial set-up, cleaning, maintenance and care. Operational Training and tutorials are not included with purchase but support is available. If you have any questions about this product by eHaiSong, contact us by completing and submitting the form below. If you are looking for a specif part number, please include it with your message.